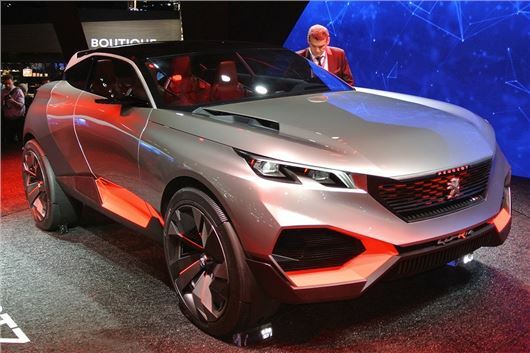 Peugeot has launched a new concept SUV at the 2014 Paris Motor Show, called the Quartz. The boldy styled hybrid model features a 500PS hybrid powertrain – but it is not set to go into production. Though it is billed as a concept it does use the underpinnings from the production 308 – but little else is familiar from the Peugeot models you’ll find in showrooms. The body panels are made of composite materials and are bonded, rather than bolted or welded together to save weight. Wheels are huge at 23-inches. The cabin is as dramatic as the exterior. There are four bucket seats, plus a head-up display and a small steering wheel featuring various controls for driving modes, as well as shifters for the gearbox. The plug-in hybrid system is made up of a 1.6-litre petrol engine tuned to 270PS, plus two electric motors – one for each axle. These can power the car without the help of the engine, giving a 31 mile range based on a full charge.